When you’ve got heaps of almond butter on your hands, you don’t take that stuff for granted. Instead, you turn it into something even more incredible. Such as double chocolate almond butter brownies, almond butter blondies, almond butter cookies OR almond butter bars. 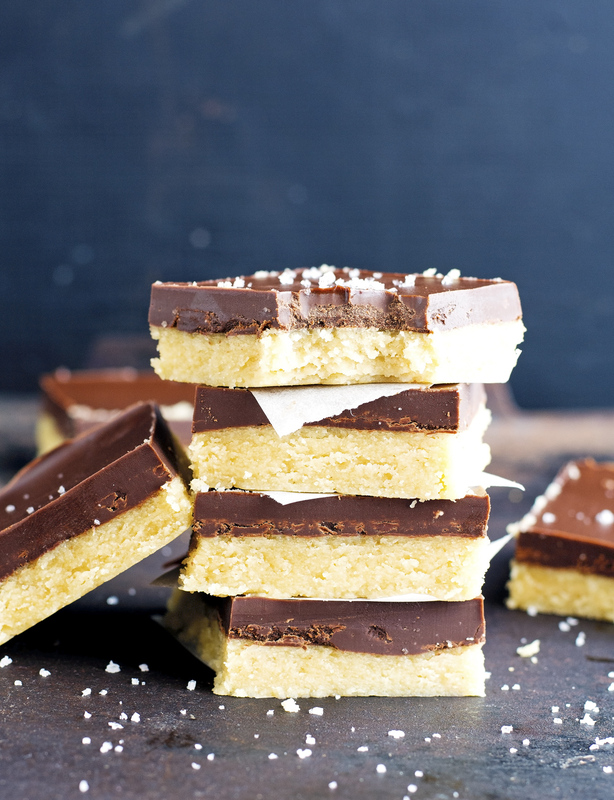 Yeah, you heard that right, almond butter bars. These (No-Bake) 4-Ingredient Chocolate Almond Butter Bars are the hotter and better-looking sibling of classic peanut butter bars. Think classier, more refined, and sophisticated. The bottom layer is smooth almond butter mixed with maple syrup and coconut flour while the top is just melted dark chocolate and almond butter. That's it. Oh man, these are good. And so simple to make: just 4 ingredients and literally 5 minutes. They are the sweetest, healthiest form of sin, the kind that will stop you in your tracks, no matter what you’re doing. So that you can take a moment to savor it and wonder how these bars can be so delicious but also vegan and paleo at the same time. Did I mention how easy these are to make? Okay, fine, I already did. I just wanted to make sure that you have grasped that piece of information. Regardless, these bars are a little bit of handheld heaven. My parents were in an uproar over the deliciousness of these (No-Bake) 4-Ingredient Chocolate Almond Butter Bars when I brought them over for dinner the other night. I may or may not have single handedly inhaled 5 or 6 of these bad boys myself. There’s just something about them that makes you lose control. Where am I? Who am I? What day is it? 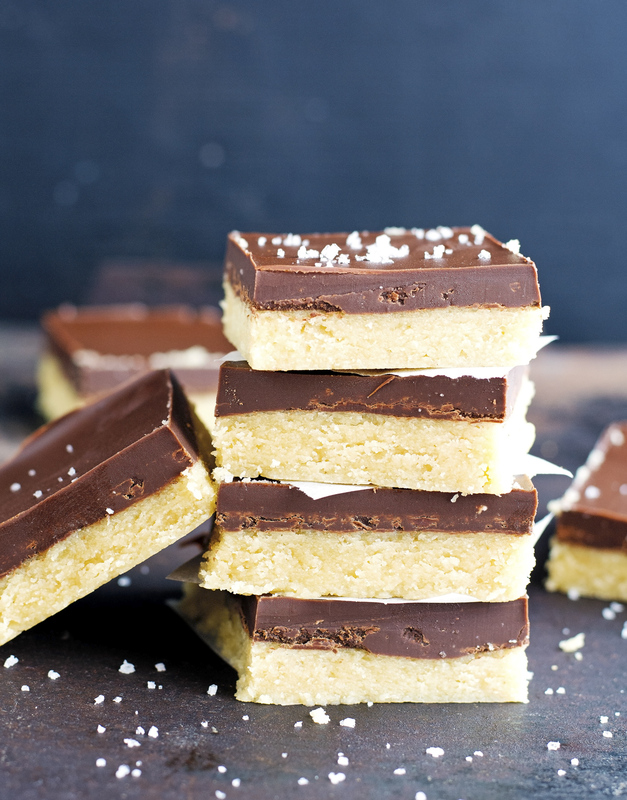 No-Bake 4-Ingredient Chocolate Almond Butter Bars (Vegan & Paleo) Print this recipe! Line a 8-inch square pan with parchment paper and set aside. In a medium bowl combine almond butter, maple syrup, coconut flour, and salt. Stir with a wooden spoon until the mixture thickens and it’s hard to stir. Pour into the lined baking sheet and using a rubber spatula smooth into an even layer. Set aside. Place dark chocolate and almond butter in a medium size heatproof bowl. Place the bowl over a pot of barely simmering water, making sure that the bottom of the bowl doesn’t touch the boiling water. Pour the chocolate mixture over the almond butter filling and using a clean rubber spatula smooth chocolate into an even layer. Tap the pan a couple of times to help even out the chocolate. Sprinkle with salt flakes if you’d like. Transfer pan to freezer and freeze for about 60 minutes, until hardened. Remove and slice into 16 squares. Store bars in an airtight container in the refrigerator up to 2 weeks. 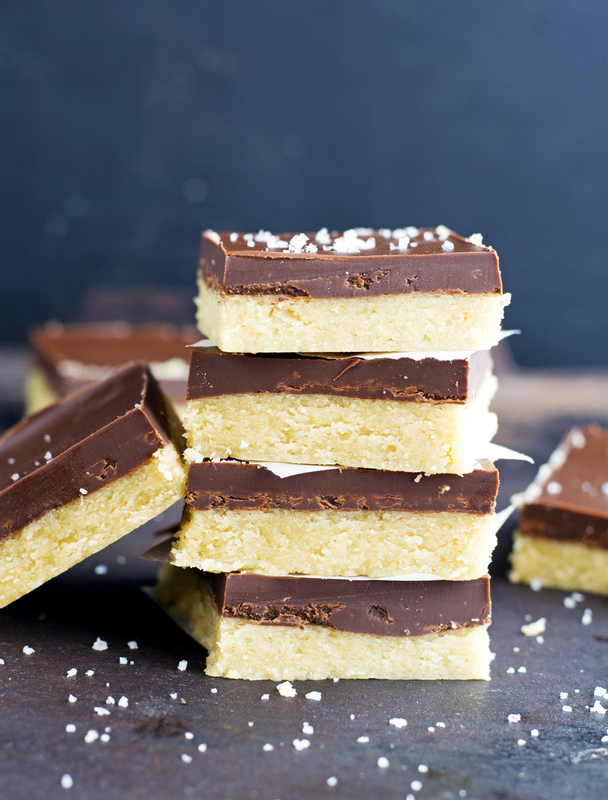 Separate each bar with parchment paper squares to prevent from sticking to each other. One bar yields 235 calories, 17 grams of fat, 17 grams of carbs, and 7 grams of protein. This is insanely great and tasty and yummy, you are awesome! These look so yummy, can't wait to give them a go! Lemme tell ya, these are insanely good. You should totally give 'em a try! These look amazing - I love how simple they are! I know right? Easy to make and delicious, they are truly the best! I am allergic to coconut flour, is there another flour you could use?